If you are going to launch a gaming startup this week, you might as well make your first game for the iPad. FreshPlanet is a stealthy startup looking to make its public debut with the launch of an educational game for children, Red Fish, on the iPad (iTunes link). FreshPlanet is based in New York City and founded by two serial entrepreneur French brothers, Mathieu and Romain Nouzareth. It recently raised a $1.5 million Series A from Jeff Clavier’s SofTech VC and a bunch of French angel investors including Jacques Antoine Granjon (founder of Ventes-privees), Xavier Niel (founder of French ISP Free.fr), and Oleg Tscheltzoff (founder of Fotolia) via CapISF. Mathieu and Romain previously founded online game distribution service Boonty (sold t French company Nexway) and casual gaming site Cafe.com. Red Fish is based on a popular French kid’s learning Website called Poisson Rouge. FreshPlanet licensed the game and developed a version specifically for the iPad to start. There is no iPhone version. “The big screen is much more interesting for us,” says Romain. 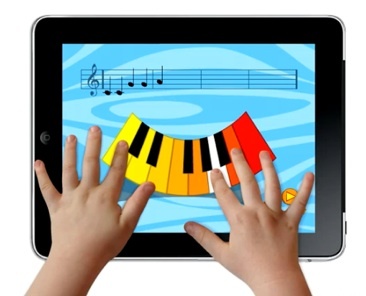 Red Fish teaches kids between 3 and 7 to count, read, spell, and even compose music all using the iPad’s engaging touchscreen. The app is free and comes with 12 different activities, but to unlock the rest (there are 50 total) will cost $9.99. You can watch a demo of the app in the video below. It gives you a good sense of how the iPad can become an educational game platform. Kids love touchscreens (mine are always fooling with my iPhone), and big touchscreens with games designed for them could prove irresistible. FreshPlanet is also testing a music quiz game on Facebook, and plans to design games for both Facebook, the iPad, and the iPhone.